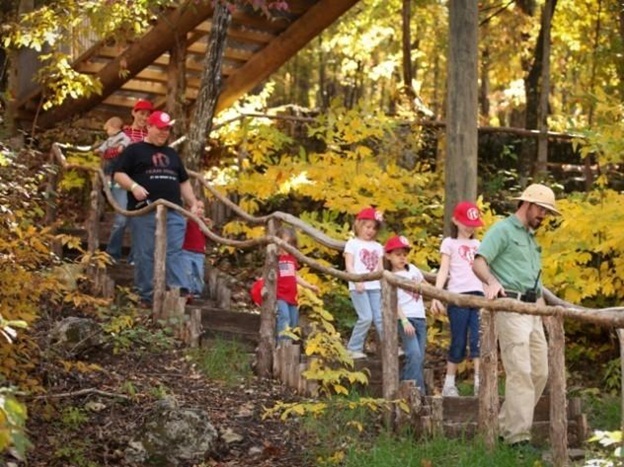 The Photo Safari Guided Walking Tour at Wolfe Creek Preserve is one of most interesting outdoor activities in Branson where you can enjoy the beauty of autumn. As you start the Photo Safari Guided Walking Tour, you are going to take a ride with the authentic Pinzgauer Swiss Army Troop Transport to bring you to the top of Wolfe Creek Preserve. From there you’ll experience a downhill walking on the trail as your guide shares ecological, topographical, and historical information about the area including the legend of Eli, Sarah, and Isaac Wolfe. Nature guide, Safari Dan will show you interesting sights for you to enjoy on this fun adventure for a unique eco-tour for all ages. As the Wolfe Creek Preserve is home to Branson Zipline Canopy Tours, the tour offers you the chance to glimpse zipliners in the area. Photo Safari Guided Walking Tour is the perfect way to discover the secrets of Wolfe Creek Preserve and the Ozark Mountains. In addition to the Safari Walking Tour at Wolfe Creek Preserve, you can also have the chance to enjoy authentic zipline canopy tours, unique shopping, and more. As you set foot onto the Wolfe Creek you’ll know you’re in a fascinating area. Dozens of 100-foot, 200-year old white oaks are dispersed throughout the area and endless clusters of ash and dogwood trees. In this unique place, you will see gray and red squirrels flying over from tree to tree while deer, armadillos, and raccoons amble along the bush below, foraging for food. You will also see in the area historic bridges and mining implements as remnants of early settlers as the stories and legends that your guide will tell you about the Wolfe Family as original owners of the property. As you approach the mid-point of the trail, you, fellow hikers and your guide will take a snack break. As you sip a refreshing water with energizing snack, you will experience a tranquil sound of nature with a relaxing atmosphere in a calm environment. Along with the enjoyable company of your fellow hikers and your guide, you’ll also have the chance to meet up with friends who opted to take the Ozarks Xplorer Canopy Tour as they’ll also have a break at the same spot as you. After resting mid-way of the tour with the company of your guide and fellow hikers, you’ll continue to hike down the mountain to complete the remaining half of the Walking Tour. During the remaining half of the tour, your guide will continue to relate interesting facts and share fascinating insight about the ecology of the land and stories that pertain to important landmarks, and other information that you’d like to know. The tour is suitable for people of all ages and sizes and it lasts approximately one and a half hours. So, if you are looking for some of the best outdoor activities in Branson, try the Photo Safari Guided Walking Tour at Wolfe Creek Preserve where you can enjoy the beauty of autumn.